This week I want to cover the letter F, and counting to three with my daughter. She's pretty good with counting that high, which is why we're starting off with it. Later we'll get to the harder stuff, like the counting to seven! Oh yea. • F is for Fox coloring page from first-school. • Matching F is for Fox online puzzle from first-school. • F is for Farm printable file folder game from Green Jello with Carrots. • Read a book with the story of The Three Little Pigs and count the pigs on each page (my daughter LOOOOOOVES pigs). 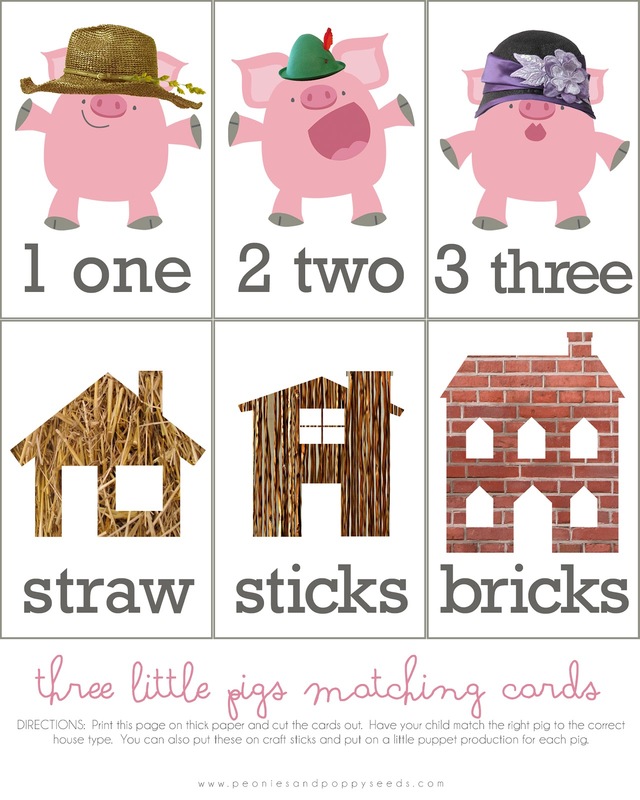 • Print the Three Little Pigs Matching Cards I just made and have her match the correct house to the pig. You might notice that I made the third pig (the smart pig) a girl. Because that's how we roll here. And after she's done matching them, I'm going to glue them to craft sticks so she can act out the story with them while she pretends to be the wolf blowing over the pigs' houses. I'm pretty excited about this week because we're doing lots of cute things! yay.